Pure elegance defines this gorgeous restored French colonial building, with airy high ceilings, tasteful design, and romantic airs with a neo-Mediterranean feel. Ad Book now! Rates from US$59.35++. Average rating 8.6 from 322 reviews. The Columns had the most polished, sophisticated feel of any of the properties that we visited in Kampot. The atmosphere is created by lots of white, open space, gently curving lines and artful splashes of vibrant colour, all beautifully offset by the traditional tiling. 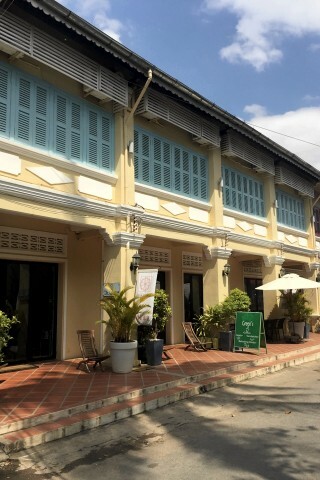 The original character of the building has been maintained, but all mod-cons are integrated into the 17 rooms, including flat screen TVs, iPod docks, DVD players and air-con. Downstairs, Green’s Cafe offers a healthy menu of salads, sandwiches and treats. The staff were supremely helpful and friendly, and managed to combine a genuine warmth with discretion. Check rates at The Columns on Booking.com.